This is taken from a white paper i just posted at http://techrigy.com/pdf/EngagingSocialMediaWhiteP.pdf. Word of mouth (WOM) marketing is currently under going a renaissance. Of course, WOM is nothing new. We were using WOM long before we began studying marketing. There is no better recommendation on a brand than testimonial from a close friend. Yet to reach global audiences, marketing became, for a long time, about shouting a message as loud as possible. This worked for a while until we, the message target, had so any messages shouted at us we perfected the ability to tune out all of them. Social media presents itself as a way to reach people without shouting. Instead we attempt to engage in two way conversations with our customer. Social media allows the customer to tell us what they want instead of us telling them what we think they want. Marketers that are able to use social media effectively will outpace their rivals. They will transform marketing into a giant sounding board that not only generates buzz, but also feeds into product development. Once your customers realize you will listen to them, they will be more than happy to share what’s good and bad about your brand giving you the opportunityy to improve. -The first section outlines steps for listening to your customers. Before you engage in any conversation, it is important you first listen to what’s being said. Imagine walking up to a group of people at a conference and immediately starting to talk loudly to the group. Wouldn’t work would it? The same applies to social media. No one will be receptive to you barging in and shouting your message to everyone. You must be engaged in the conversation before you can contribute. You should understand the context of the conversation before you engage. - The second part of the guide is engagement. Of course, how you engage takes a lot of common sense. This is a guide, so we will give you some ideas and steps, but ultimately you will need to assess the situation and evaluate careful before engaging. Not every situation calls for the same response. Don’t take these guidelines as hard and fast rules. Instead, use it as a guide to getting started and help in steering you in the right direction. Listening is the first stage of any plan of attack. Spend some time understanding why and where conversations are happening. Get comfortable talking the language of the people having the conversation and get to know the accepted practices of the group. Step #1 - Start monitoring what people are saying about your brand. Start by trying to understand what the crowd is saying about your brand. What are the negative and positive sentiments? Where are the conversations occurring? In the US, Europe, Pacific Rim, or South America? Listen to the negative comments on your brand. What are the roots of the comments? How can you make changes to your brand to change these negative opinions? See what the positive comments are. Can you leverage these positive comments with customers and prospects? What can you do to re-enforce the positives around your brand? Make sure you are getting as comprehensive a view as possible by tracking all of the varying social media including blogs, wikis, video sharing sites, social networking sites, micro-blogs (like Twitter), forums, and message boards. Keep historical records of the volume of buzz around your brand so you can see the affect your efforts have. You’ll want to track the buzz on a monthly basis so you can see the ups and downs and work to map your efforts to these changes. Step #2 - Start monitoring what people are saying about your competitors. Monitor your competitors as closely as you are monitoring your own brands. This can give you competitive insight into what people hate and love about the competition. The people that hate the competition may end up being your fans if you can avoid making the same errors the competition did. Can you figure out what about the competition people love? Can you beat the competition at their own game? Monitoring the competition can help in several other ways. It’s useful to know the volume of buzz around the competition versus your brand. This can help you evaluate your competitive stance and to know how much work you have. If you find your brand’s buzz significantly lower, that’s good news because you’ll have plenty of room to improve. Find blogs that reference your competitors and make sure you are engaged in these conversations and getting your share of the buzz. The worst possible situation is to have your customers and prospects engaged in a dialogue with the competition that you don't know about. Step #3 Start monitoring what people are saying in your industry. There are many conversations going on around your industry that likely reference neither your brand nor its competitors. Yet these are places that your customers and potential customers frequent. These conversations are the low hanging fruit. Listen to them and see what they are saying. Anything you can learn from them? Anything you can contribute to them? Finding these conversations and get engaged in them can be very rewarding. Create buzz but don’t over-hype your product or company. Once you’ve gather another information, you are ready to begin engaging social media. Below are steps to get started. There are many approaches to blogging that can be effective. Some organizations setup a single blog for the company. Others promote the idea of blogging and allow their employees in to blog as individuals. Generally speaking, encouraging your employees to blog is more expensive but more effective. You’ll have to accept that some of each employee’s time will be invested into blogging to promoting the company. But the voice of the employees will be more valuable and more transparent to the readers. Of course, you need to make sure that when you blog you have something interesting to say. People expect you to contribute to the conversation. Be interesting, insightful, and useful when you blog. You are engaging in a conversation. You’ll have to stimulate those conversations if you really want to get them started. When you start blogging, you are creating conversations. When you are commenting on other blogs, you’re engaging in existing conversations. Make sure your comments contribute to the conversation. Offer a different point-of-view, share ideas, feedback, additional information, etc... Don’t pitch - educate and inform instead. Once you comment, you should check back to continue the conversation. Expect people to comment on your comments, and then to comment back. It’s important to make the conversation two way. Another way to get engaged in some of these conversations is using linkbacks (http://en.wikipedia.org/wiki/Linkback ). Linkbacks allow you to comment on and talk about someone else’s post on your own blog. Using a linkback you can start additional conversations built on other conversations. Step #6 Participate in conversations on tools such as Twitter. Stay up to date with the new technologies that are facilitating these conversations. Get your own account on Twitter, FriendFeed, and other platforms that allow you to engage in the conversations. These platforms have search/track capabilities to allow you to find and “follow” people that might be interested in your brand or that might even be having problems with your products. Being out there, helping people having problems, and understanding peoples’ complaints is very important. Check out Frank Eliason (http://twitter.com/comcastcares ) and how he is making a big impact on Comcast’s image by listening to conversations on Twitter - http://bryanperson.com/2008/04/28/comcastcares-is-listening-and-not-only-to-michaelarrington/. Social networks are a useful way to promote your brand. There are really two different ways to accomplish this. One is to leverage existing public social networking sites, such as FaceBook or MySpace, to try to build fans around your brand. There are various stories of brands getting huge numbers of followers through MySpace and FaceBook groups. It’s certainly possible, but it certainly takes a certain type of brand. Bands and movies are great targets for generating fan buzz - but it’s a whole lot less likely if your brand is a business service or tissues. People just aren’t going to flock to your brand. It’s still worth getting out to these sites, starting a group or community, and then inviting people that might be interested to the group. The huge successes will be few and far between, but it certainly won’t hurt. Your other option is to build your own social networking site using platforms such as Ning (www.ning.com ). Setup your own social networking site and offer coupons, product hints, and even direct access to company employees through the site. Use the site to gather feedback on your brand, encourage people to leave ideas and complaints about your products. Then figure out how to fix them. After you create you site, you will need to promote it. Use bloggers and other viral techniques to try to get the word out on your site. Step #8 Contribute to sources such as Wikipedia. Wikipedia is one of the most popular social media platforms. Some reports indicate that 1 of every 200 page requests is for Wikipedia. What does that mean for your brand? To start with, marketing yourself through Wikipedia is nearly impossible. Wikipedia does not like this approach. Case in point, Microsoft attempted to adjust some language used around an entry by hiring an expert to make the edits. Guess what? It didn’t fly with Wikipedia! It’s not going to fly for you either. Also, it’s important to be aware that what is being posted anonymously on Wikipedia is being monitored. Tools such as WikiScanner (http://wikiscanner.virgil.gr/ ) map anonymous entries from IP addresses to organizations. Reviewers can find changes made by an organization that are clearly PR moves or other attempts at manipulating points of view. Again, transparency is the only acceptable way to even try to contribute to Wikipedia. A few suggestions. Use the Talk pages to help editors understand why edits should be made. If you make edits directly yourself, there’s a good chance it will get taken down. Be factual and cite references for any edits you make. Even an inkling of marketing hype will immediately result in you losing credibility with the Wiki Editors. As well, consider getting your brand out on other websites, such as AboutUs.org and Wikia.com. See these other sources for more on Wikipedia editing. Step #9 Encourage your customers to talk about your product, good or bad. Offers incentives for people to talk about your brand. Simple incentives are enough to give people the motivation to talk about a brand they like. Something simple like cool stickers, coupons, an upgrade of your service, or even just a link back to a blogger and some recognition are enough to generate some buzz. Don’t use incentives like cash or valuable prizes. You invite insincere buzz which almost always backfires as well as the potential for fraud. When people know you are compensating others for hyping your brand, they lose credibility immediately. Keep it simple when encourage people to spread the word. When you see someone post something positive or negative on your brand, give them a shout out or a link back from your own blog. Let them know you are listening and that you care. When you find something negative, don’t ignore or bury it. Find a solution for the problem. Turn the negative into a positive. Let the person know that there are people at the company that care and want to find a solution to the problem. Link to the problem from your blog. This lets everyone else know that you care about fixing problems when they occur. Companies pretending that they never have a complaint aren’t fooling anyone. Companies that show how they handle problems positively stand out. Don’t stand idle and let social media run you over. The fact is that you can make a big impact on the buzz around your brand by taking the right steps. You won’t be able to change the perceptions and buzz around your brand overnight using social media, but you certainly will be able to make an impact and get insights you’ll likely not get anywhere else. One last recommendation - pick up a copy of the book Groundswell. The book gives so much depth on understanding and using social technology, it is a must read for anyone marketing in today’s world. We invite you to get started today listening to these conversation happening over social media using an SM2 Freemium account (http://sm2.techrigy.com ). SM2 gives you complete monitoring and analysis of social media for an unlimited period of time. Yes, that was one of the intentions of SM2, to provide a way for EVERYONE to measure this stuff. Very different perspective than the Buzzmetrics of the world which just aren't reaching the masses. Every brand needs help - not just the big ones. I just started a discussion on http://www.insocialmedia.com around using social media measurement to track the effectiveness of new media campaigns. I'm starting to map out how this can actually be used to get real numbers that can be used in an ROI model. 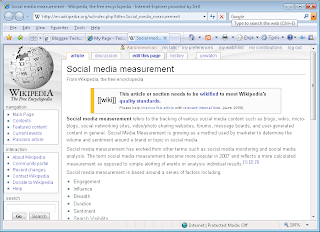 I created a page on Wikipedia for social media measurement. It's very rudimentary at this point. I invite everyone that has something to contribute to the page to come and edit it. It would be a great way to learn about how Wikipedia pages are created and edited. BlogBackupOnline will be down for the weekend. We are moving the server into a new data center. All your backups will continue and we will be back online ASAP over the weekend.